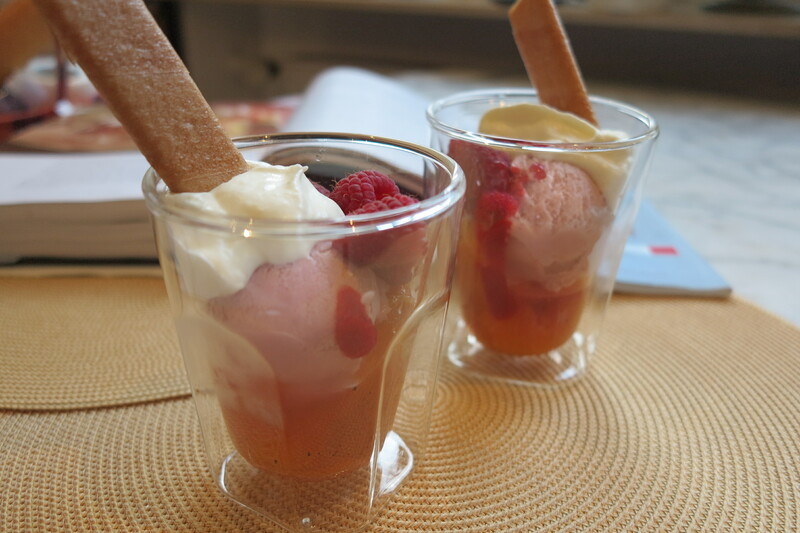 This week’s French Fridays with Dorie recipe, Peach Melba, is the big 1 0 0! That’s right, we have now made 100 recipes from Dorie Greenspan’s Around my French Table. Ok, full disclosure, I personally have only made 99 because I am officially boycotting the olive fougasse recipe until the day after I buy a standing mixer. But still, it is a noteworthy milestone. When I first set off on the grand adventure of cooking my way through Dorie’s delicious book, I wasn’t working and was dealing with some not so fun medical stuff, all of which left me with lots of time for thinking. Thinking too much in such situations is never good and I desperately needed a distraction. I was aware that Dorie had a new book and a new cooking group, I liked to cook, I liked Dorie, why not throw my spatula into the ring? Maybe I would learn something new along the way, improve my kitchen skills, and get some tasty food out of it to boot. 100 recipes later (okay okay, 99) a lot of things have changed. I have a new job and I haven’t set foot in a doctor’s office in over 6 months (yay!). But this group has turned into so much more than the distraction which I was initially looking for. I really have learned a lot and made some crazy delicious food which I never would have made were it not for this group. And I have met a fun and amazing group of home cooks whose company I truly enjoy. All of these thoughts were going through my head as I made this week’s recipe, which turned out to be the perfect milestone for several reasons. Not only have I never made Peach Melba before, I’ve actually never tried or even ever heard of this dish before. Had someone asked me, I probably would have guessed that it had something to do with peaches and melba toast. 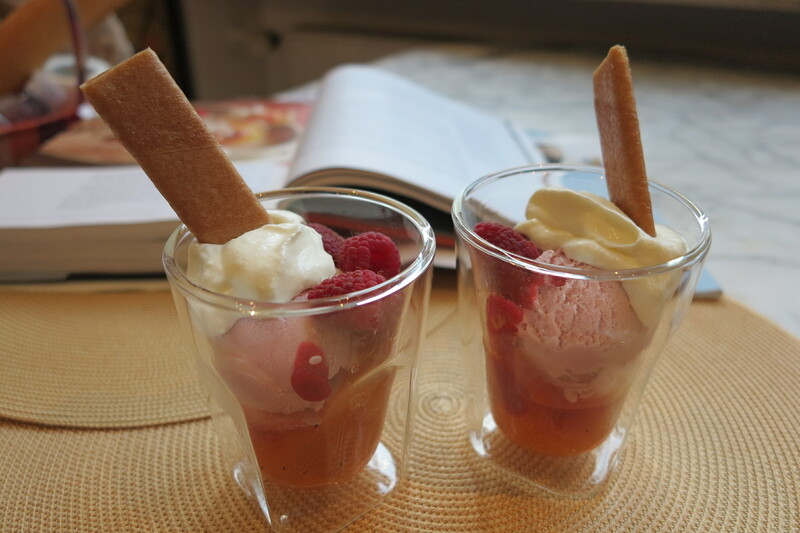 But no, it turns out that peach melba is an ice cream sundae made with poached peaches and, at least in Dorie’s case, home-made raspberry cassis ice cream. Which begs the question, HOW had I never heard of this before? That’s why I love Dorie’s book and why I love this project. Dorie has introduced me to so many wonderful recipes which I had never made before and this wonderful group has given me the support and encouragement to keep cooking and trying new ones, one week and one recipe at a time. I’ve had a blast with this first 100 and can’t wait to see what the next 100 brings. This entry was posted in french fridays with dorie and tagged Around my French Table, dessert, seasonal - summer. Bookmark the permalink. How impressive! 99 (and yes, you will live the olive fougasse when you get around to making it)! It has been a terrific journey. And your dessert looks suitably lovely! Well done! Wow! I’m impressed you made 99 of the recipes! There were some I just couldn’t bring myself to make…salmon in a jar comes to mind! However, this wonderful peach melba…count me in!! Yours looks beautiful…love the cookie!! Happy 100th! Happy Friday! Congrats on making so many of the recipes! The fougasse is great and a stand mixer is NOT a luxury! It’s been wonderful cooking along with you and reading your posts. I’m looking forward to all our future French Fridays adventures. I am only up to 99 as well, as I missed the butter glazed carrots – I was away at the time. 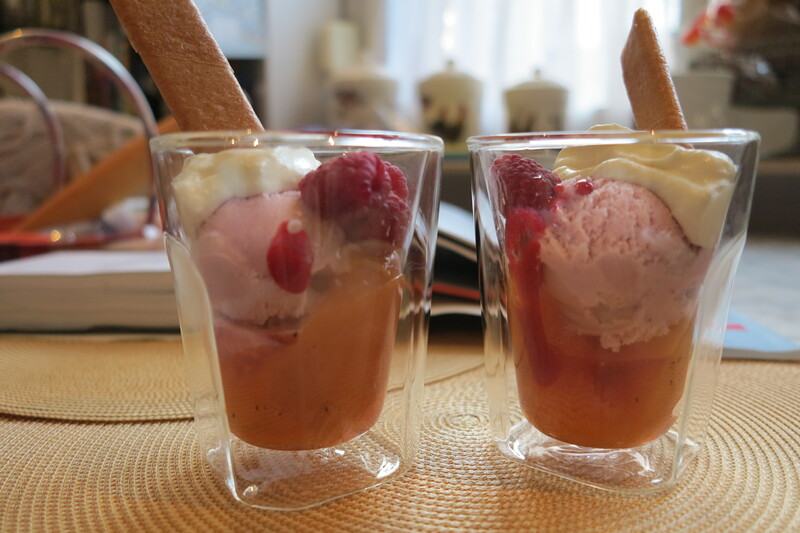 Your peach melba looks grand – I loved this, and was pleasantly surprised by the fact. It seemed like a lot of work, but the end result was worth it. I was happy with this dessert as well. Great post! Congrats on such a grand total. The melba looks lovely – although I have heard of it before, I had no idea what it actually was. It’s been a pleasure cooking along with you each week. Just beautiful, Rose! I agree – we’ve made so many great things that I never would have tried otherwise. I expected to become a better cook, but not to make such wonderful friends. 99 is totally impressive! I recently printed out the list to see how many recipes I’d made & missed. Some of the ones I’ve missed, I still want to make up – others, not so much! Glad to hear you’re in good health! And, I would love to be sipping a sparkling glass of wine with peaches with you! Congrats on 99 Rose – it’s been lovely to meet you through this and it’s such a great group of cooks and bakers. I look forward to seeing you complete the fougasse when you finally get your stand mixer ( good for you for standing your ground!!). Happy weekend! Well, I think you deserve the 100 ribbon anyway! I will have to try the peaches when the season comes, they sound so good. Beautiful peach melba and thanks for the pomelo vs. grapefruit info! First, Rose, let’s talk spreadsheets. Mardi let the cat out of the bag that you made a FFWD spreadsheet to track your recipes. I have got to have one of those. Really. And, my suggestion (and I know I can speak for Laurie and Betsy, also) is that we post it on our FFWD link (if possible) and share it with the whole gang. This would be the first cookbook/cooking group in history, I am quite sure, to be working with a spreadsheet. Next, I personally will place you a a pedestal right next to Mardi, olive fougasse or no. You’re a Century gal also. Quite an accomplishment. And, you have cooked through thick and thin. I remember that you had a rather inconvenient house intrusion with the loss of a camera that would have sent me to “bed” for weeks. You never missed a beat. You expressed my feelings about this group also – it’s been a lifesaver for me. Also, the Peach Melba. I’ve had it five or six times but have never made it. I love that I can now make it and serve it – such an elegant and delicious dessert.Let me know if you can easily share the spreadsheet. Happy #100! You go, girl…reaching 99 is a huge accomplishment!!! And I cracked up when Mardi mentioned you had a spreadsheet…can you send some of your organizational skills my way? Rose, what a wonderful tribute to the group and the 100th recipe and congratulations to you! I take my hat to all of the Doristas who have cooked and baked their way through so many of Dorie´s recipes and although I only joined this incredible group a few months age, I am loving every bit of the experience – so nice to have met all the other talented and dedicated Doristas and I am looking forward to the next 100 and more recipes. 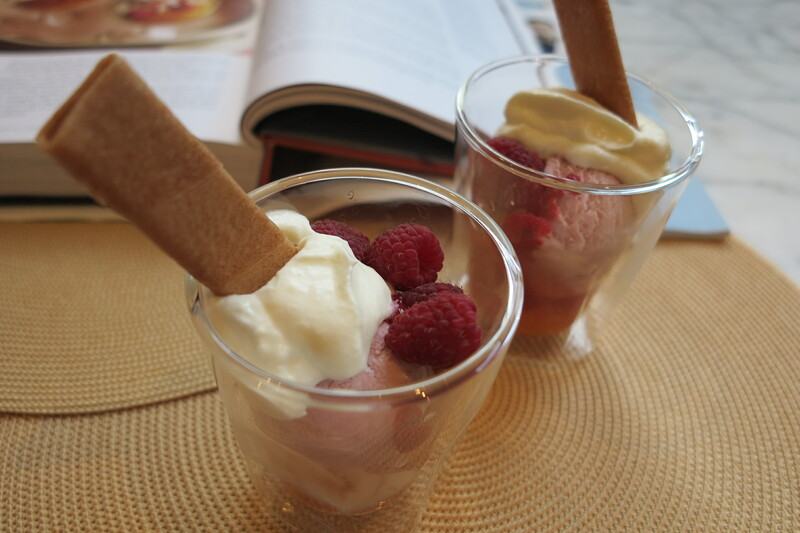 Having said that, your Peach Melba looks delectable, glad that you enjoyed this summery recipe! Have a nice Sunday (it is raining here and it looks like fall with all the leaves falling off the tress)! reading your blog for the next 100 recipes. WOW, 99!! Thats still noteworthy! I have only made 70 so far and have a lot of catching up to do, but in the meantime, I get to watch my babies grow! 🙂 The peach melba was good wasn’t it?? I hadn’t heard of it before either and it was truly a delicious treat! 99 is impressive, and you have the perfect excuse for why you didn’t make the olive fougasse. It does beg the question of how you managed to make the brioche without the stand mixer. That would have been tough. You really need to get yourself a stand mixer. You deserve it. 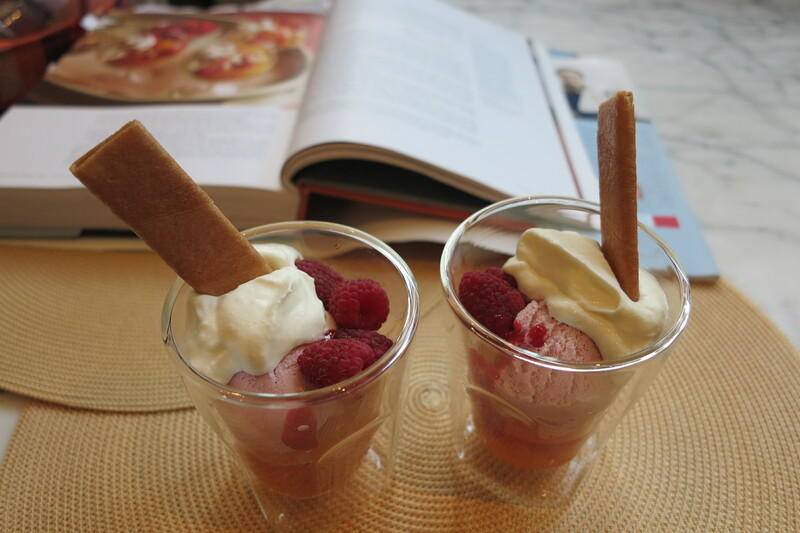 The peach melba was a great milestone recipe because it was like so many of the recipes, easy yet elegant, its sum greater than its stellar parts. I’ve enjoyed getting to know you as we cook through the book together. Here’s to the next 100! Cheers. That looks sooo good! I’m waiting for peaches to come into season before I attempt this! I totally understand how helpful having this group can be, to give you a break from your thoughts and bring you into the present moment!